Play Day Saturday are clothes for taking your kids to the park, running errands, talking your dog for a walk, shopping, picnicking, travel, going to a museum or a zoo—out and about or home having fun clothes. These are the clothes you often live the best parts of your life in! If you want to read the posts all at once, use the Saturday POW tag. Outfit: Beyond Tee,Spacedye M’leggings, Cobblestone Cardigan, and the Chelsea Charm Necklace from cabi Fall 2016. Black Agate Spike Bead Pendant Necklace and commissioned earrings by Shine Chaser Jewelry. Kady Pointed Toe Lace Up Ballet Flats by Mossimo Supply Co. from Target. Destructed White POW: Shady Lace & Rips Saturday: For fun, cool, sophisticated take on the white-out trend, opt for mixing off whites. Outfit: Destructed Slim Boyfriend jeans from cabi Spring 2016, Capri Top from cabi Spring 2016, Simple Cami from cabi Spring 2016, Bird Cage from Aerosoles, faux gold pearl earrings bough years ago, Tile Coin Necklace from cabi Fall 2014 (available at some cabi outlets), Diamond Woven Crossbody by Giani Bernini from Macy's, Shady Hat from cabi Spring 2014 (available at some cabi outlets). For inspiration and ways to make this work from your wardrobe, read the post! Casual, Easy Boho Saturday: For a distinctive, comfy, boho chic outfit, think outside the jeans box—wear flowy pull-on pants and a denim shirt instead. Outfit: Bardot Shirt, Villa Pant, and the Marisa Top from cabi Spring 2016. Simple Shell Bead and Silver Wire Earrings by Shine Chaser Jewelry. Yellow Agate Crystal Pendant with Black Lava Stone Beads on Silver Hand Wrapped Wire Chainand Black Agate Spike Bead Pendant on Silver Stainless Steel Chain Necklace both by Shine Chaser Jewelry. Lapis Owl Bracelet, Lapis Bracelet, and the Black Jasper Chain Bracelet all by Solid Treasures. Feather Ring by Solid Treasures. Acme Bootie by Crown Vintage sold at DSW. See the post for more inspiration. Outfit: Margherita Dress, Blanca Cardigan from cabi Spring 2016. Belt unsure. BMC Womens PU Faux Leather Perforated Cutout Pattern Boston Top Handle Handbag at Amazon. Yet Plane by Aerosoles.Necklace: Citrine Chunk Bar Pendant by Shine Chaser Jewelry. Yellow Bead Earrings from Fab’rik. Love Bracelet by Shine Chaser Jewelry and Samantha Jewel & Bead Stretch Bracelet Set from Cents of Style. For some available alternatives to these no longer available items, along with styling tips, check out the post! Outfit: Run Around Skirt and the Martini Top from cabi Spring 2106. Acme Bootie by Crown Vintage sold at DSW. Classic navy stripe tassel clutch and the Burgundy/navy stripe bangle by Sloan Ranger. Studded Collar by Bauble Bar (no longer available). Gold dangle earrings from Fab’rik. Old big floppy hat I’ve had for years. For some available alternatives to these no available item, along with styling tips, check out the post! Outfit: Plume Top, Blanca Cardigan, Destructed Slim Boyfriend jeans all from cabi Spring 2016. Gilded Leather Cuff Bracelet by Bauble Bar. White Stone Sutton Necklace from Stella & Dot and is not available. Unisa Eavvi Sandal sold at DSW. Earrings are older. For style details and tips, see the post. Denim on Top Saturday: Wear your denim on top with classic black pants for a casual, fun, and modern outfit with a touch of class. Outfit: Go-To Trouser, Bardot Shirt, Layer Tank in Tiger Lily, and the Flora Scarf from cabi Spring 2016. Long Multi Beaded Necklace with Suede Tassel from Target. The earrings are made for me by Solid Treasures. Restricted Newport Flat from DSW. 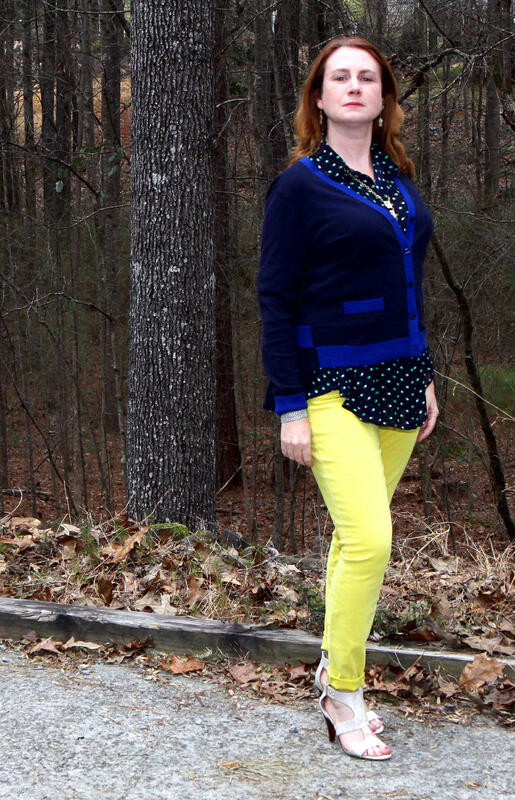 Analogous Color Fun Saturday: Combine analogous colors to create a fun, easy, and harmonious outfit. Outfit: Michelle Cardigan, Martini Top, Citron jeans in Curvy or Regular (Curvy shown), Lagoon Necklace (on backwards), part of the versatile Villa Necklace, and the Dolce Charm Earrings all from cabi Spring 2016. Shoes are the Unisa Eavvi Sandal sold at DSW. Flannel Geek Chic: Mix geek with trendy and a comfy flannel shirt, for a practical geek chic look. Outfit: Slightly Fitted Scotch Plaid Shirt in Deep Evergreen Tartan, previous season of cabi M’Leggings (current season: cabi Mesh M’Leggings), Tea Rex t-shirt, Silver Ag chemical symbol necklace, Ellie Ballet Flats, and dangle star earrings from Hancock Fabrics. Sweater Saturdays are Pretty Cozy: Start with a cozy sweater and add feminine and practical pieces for a casual, pretty, and lifestyle-friendly look. Outfit: Fall cabi Love Blouse, Countryside Sweater, and Knight Skinny Jeanse, along with older Target boots and rose gold wire wrapped crystal earrings by Shine Chaser Jewelry (similar). Get tips and a spring version of this in the post! Play Day at the Track Saturday: Reach for your comfort classics in clean crisp colors and add a nice jacket for a comfortable, classy look. Outfit: Fall 2015 cabi Media Jacket, Swing Tee, and Tee, and Track Pant. Earrings are an old, beloved pair of A2s from Aerosoles. Likewise, the earrings are older Stella & Dot. Check out the post for details and inspiration.